MRI Scanner is the Medical Imaging device used to image the soft parts of the body especially the Brain. 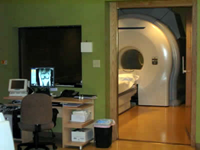 Magnetic Resonance Imaging or MRI is the technique used in MRI scanner to provide the detailed structure of the brain. Unlike CT (Computed Tomography) scanning, MRI uses no ionizing radiation but uses powerful magnetic field to align the nuclear magnetization of hydrogen atoms in the water content of the body. Diseased tissue, such as tumors, can be detected because the protons in different tissues return to their equilibrium state at different rates. By changing the parameters on the scanner ,this effect is used to create contrast between different types of body tissue.Patients with some metal implants, cochlear implants, and cardiac pacemakers are prevented from having an MRI scan due to effects of the strong magnetic field and powerful radio frequency pulses. Unauthorized use and/or duplication of this material without express and written permission from this blog’s author and/or owner is strictly prohibited. Excerpts and links may be used, provided that full and clear credit is given to D.Mohankumar and dmohankumar.com with appropriate and specific direction to the original content.